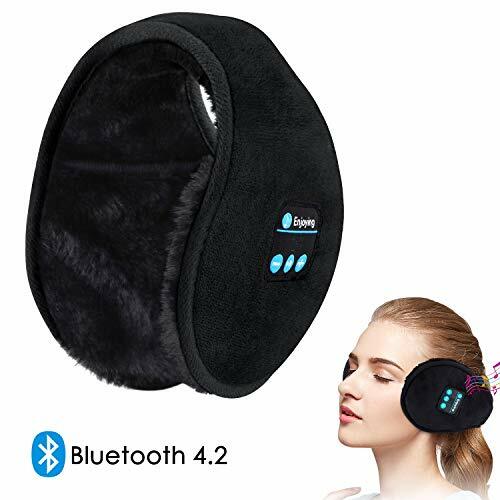 【SUPER COMFORT &HIGH QUALITY THERMAL EARMUFFS】The outer layer of BLUETOOTH EARMUFFS made of high quality superfine particle fleece fabric, ventilation and more warmer, fells soft and comfortable; inner use of imported high quality plush, bright and distributed,as a soft of the silk. Giving you a leisure comfortable experience when wearing it at indoor and outdoor activities. 【ENJOY HD MUSIC EXPERIENCE】This wireless music ear headphone is used latest Bluetooth 4.2 technology, and available for most devices with Bluetooth function, allowing you enjoy enhanced music listening experience with advanced digital sound, delivered by high performance stereo loudspeaker driver while keeping warm. 【BUILT-IN CHARGEABLE BATTERY】Built-in Upgraded 200mAh chargeable battery,charge enough 2-2.5 hours will continue to play for about 6- 8 hours of talk or music time. 【WASHABLE&PORTABLE】Our music ear warmer is fully washable after removing the inner speakers out from both two ear pocket, easy to put the speaker out and install; it can be folded to a compact form for easy storage and portability. 【GIFT PACKAGE&KEEPING WARM IN CHRISTMAS OR WINTER】With exquisite gift box packaging for our warm earmuffs, you can send it as birthday,Christmas gift to your friend,it keep your ears and even your neck comfortable,can protect against your ears on chilly day during outdoor activities, extensively applicable to the skiing,hiking, walking the dog, and morning running, outdoor work in winter. These Bluetooth Earmuffs Are Extremely Comfortable! Packaging wasn’t good. Quality was okay.